Scrooge juggles all your outgoing subscriptions and notifies you before they are due. Never mistakenly pay for the 'free' trial (that has expired), or the SaaS/PaaS/*aaS that you signed up for but have since forgotten about. 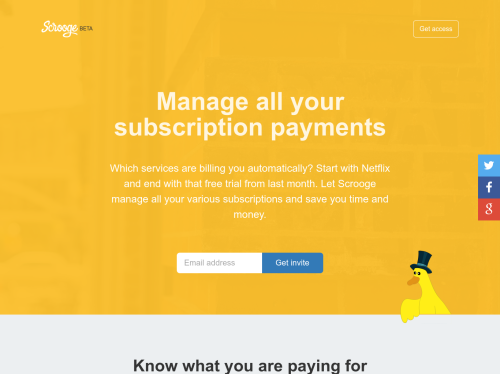 Let Scrooge rescue your money from subscriptions that renew automatically. Scrooge lets you manage all your subscriptions in a clean and beautiful UI, so you always know what you are paying for. It takes 5 seconds to tell Scrooge about your new subscriptions: simply use the Chrome extension, or forward the confirmation email.